BIRMINGHAM, Ala. – For the second consecutive day, Will Power topped the time chart as Verizon IndyCar Series wrapped up a two-day Open Test at Barber Motorsports Park. Power, driving the Chevrolet-powered No. 12 Verizon Team Penske car, recorded a lap of 1 minute, 7.0608 seconds. He posted a best lap of 1:07.6492 on March 17. Power recorded 62 laps in the session that was delayed because of cold temperature and an intermittent mist in the morning. “Coming back to Barber, hopefully we found a happy place,” said Power, who’s won the Honda Indy Grand Prix of Alabama at Barber twice in its four years. “Obviously the temperature will be a lot different, and I think that brings out imbalances in the car. It was so cold today and there was so much grip that I think it was hard to get good reads on changes. The depth of the field was evident on the time sheet: 17 drivers were less than a second off Power’s pace. Justin Wilson in the No. 19 Dale Coyne Racing entry was .0038 of a second back and the quickest with the new twin-turbocharged Honda engine. Reigning Verizon IndyCar Series champion Scott Dixon and Takuma Sato joined Power among the top five on the time sheet both days. Also for the second consecutive day, Honda and Chevrolet split the top 10 on the time sheet. Dixon, who has been the runner-up each of the four races at Barber Motorsports Park, had a best lap of 1:07.0791 in the No. 9 Target Chip Ganassi Racing car. Sato, driving the No. 14 ABC Supply car for A.J. Foyt Racing, was fourth at 1:07.3314. Ryan Briscoe, who returns to Chip Ganassi Racing Teams for the first season since 2005, was fifth quick (1:07.3705) in the No. 8 NTT Data car. 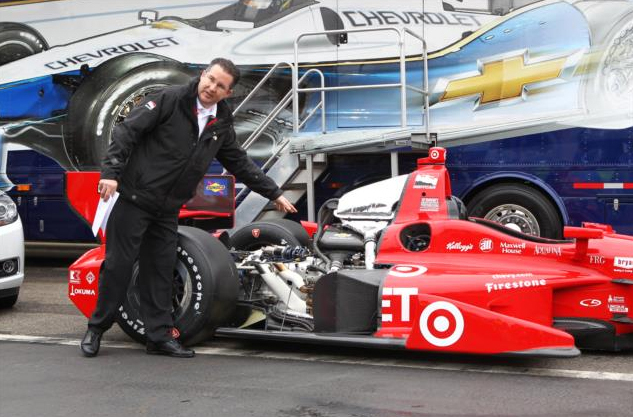 Andretti Autosport rookie Carlos Munoz laid down a field-high 121 laps over the two days. The Verizon IndyCar Series start on the streets of St. Petersburg, Fla., on March 30 (3 p.m. ET, ABC). Barber hosts the Honda Indy Grand Prix of Alabama four weeks later. Chris Berube contends that some of the best innovations come to fruition from constraints. 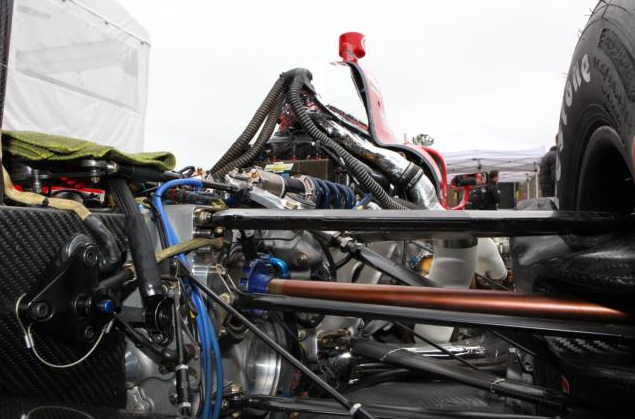 The program manager for Chevrolet Racing (photo below) pointed out features of the 2.2-liter, direct-injected, twin-turbocharged V6 engine fueled by E85 that will be used for the 2014 Verizon IndyCar Series season. Behind the No. 10 Target Chip Ganassi Racing car, which was used as a model for the stressed member of the car, was a 2014 Chevrolet Malibu with a 2-liter, direct-injected, turbocharged 4-cylinder engine to note the relevance between the racing and consumer products. Within the INDYCAR constraints for the engines supplied by Chevrolet (with partner Ilmor Engineering) and Honda Performance Development, engineers seek performance advantages within the rules through – and other items – managing the air and fuel mixture for more power and increased fuel economy. Engine manufacturers have some leeway in development, such as a 20 percent larger volume plenum (the chamber or reservoir of air that supplies the engine) for 2014 and new valve sizing and porting of cylinder heads. They’re also up against an increased durability mandate for the 18-race season to 2,500 miles between overhauls. Each entry is allowed four fresh engines for the season, with the count starting at the Open Test this week at Barber Motorsports Park. “Those are pretty big challenges for an engineering team to execute on,” Berube said. Honda for 2014 has joined Chevrolet in developing and producing a twin-turbocharged engine. Both use the BorgWarner Turbo Systems’ model 7163, which is new for 2014. Upgrades to the Dallara chassis and evaluation of a steering damper have been initiated by INDYCAR with Verizon IndyCar Series driver input. The chassis enters its third year of competition on the most diverse set of racetracks in motorsports, including the 1.8-mile, 14-turn temporary street circuit for the season-opening Firestone Grand Prix of St. Petersburg on March 28-30. Carbon fiber panels bonded to the exterior and interior sides of the cockpit (photo below) supplement the Xylon anti-intrusion panels introduced in 2008. The additions will increase the chassis’ side impact integrity by 60 percent. Additionally, a carbon fiber reinforcement ring is being added to increase the structural integrity of the cockpit opening. The upgrades will add about 10 pounds to the rolling chassis. Work, which began in January, is being conducted at Aerodine Composites Group in Indianapolis. The update will be required for all cars entered in the Indianapolis 500 Mile Race on May 25. Upgraded Helmet TestingA modification of the headrest surround for road and street courses reduces the low G force levels usually seen on bumpy street circuits when the driver’s helmet buffets the headrest. The Kevlar covering, which was hard after being painted, has been replaced by Nomex. The Nomex wraps three different densities of Confor Foam and EPP (Expanded Polypropylene) foam. The Confor Foam addition didn’t affect high-end G force impact performance in testing conducted at the Center for Advanced Product Evaluation in Westfield, Ind. Additionally, EPP, an engineered plastic foam material utilized in the fourth-generation chassis and in molding driver seats, will replace carbon panels on the outsides of the drivers’ thighs. The road course rear wheel pods have been strengthened to match the ones utilized on ovals. Its shape has not been altered. INDYCAR commissioned Dallara to investigate a steering damper. The hydraulic device built into a steering rack will have its initial test in the near future. Walker said power steering in the future hasn’t been ruled out.